Recently, I was on assignment in Sonora, Mexico. I’d never been to the specific region and was looking for culture, music, cuisine, genuiness and exotica. I didn’t know I’d find my passion. The impossibly picturesque town of Alamos is just a few hours drive from the Arizona border. Although it is highly tourist-friendly, it still maintains the magic of old Mexico. 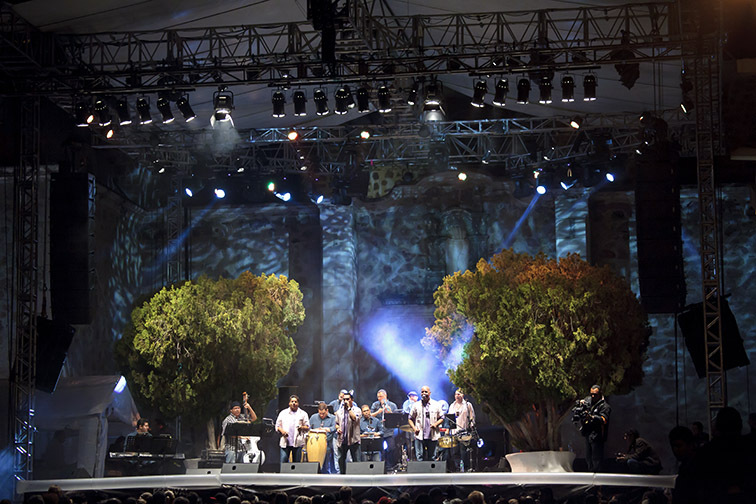 I was there with 25,000 other music fans for the annual Dr. Ortiz Tirado Festival, when Andalusian architectural venues reverberate with everything from classical to mariachi, from singing of local celebs to international stars, and from a pickup street trio to a kickass 15 piece Puerto Rican show band. But, it turns out, those buildings hold a lot more. And that’s where my real interest resided. Dr. Navarro (in Latino countries the second to last family name is customarily used) was returning from a late-night house call in the remote hills outside town. He was tired but suddenly became hyper aware and inexplicably fearful. Then he realized he was isolated on a deserted and cursed section of highway. “The old lady place” -so named by locals because of sightings of a ghostly woman in white who’d appeared suddenly to travelers and then, even more quickly, vanished. Anxious to move on, Navarro pressed the accelerator. His car died. Navarro repeatedly turned the key and mashed the gas pedal. Nada. As darkness and cold sweat enveloped him, he called out to his deceased father for ethereal help. The engine roared to life. Navarro gripped the wheel and pressed ahead. But, a few yards later, darkness again seized both car and driver. The good doctor diagnosed the situation as needing a higher second opinion, pulled out a holy cross and prayed. He could hardly hear his own flurry of words over the beating of his heart. When his breathing calmed, he felt the comforting vibrations of a purring engine. Still praying, he drove slowly away and to safety. Te vain Professora refused to surrender her age, even in death.I was unsure and still recovering from my empathetic encounter. But how could I not? I indicated yes and made an appointment with the doctor for 5 that afternoon, in the graveyard. I arrived on a tourist tram that had been customized to resemble a circus train. The “engineer”/driver, who was attired in a bright uniform, had seen the spectral woman in white three times and had photographically captured mysterious “balls of light” which had not been visible to his naked eye. While it was possible to be skeptical about the eerie anecdotes of a costumed tour guide, such was not the case with a trained medical man who was also the town Mayor. He was credible, and responsible. There was also something about the way Dr. Navarro related the information. He met me and we entered the graveyard. The Alamos cemetery was like a dozen others I’d visited in Mexico; ornate, crumbling, sadly touching and, sometimes, even humorous. Still, I couldn’t understand why my host had selected this particular meeting place. We ambled through the low stone forest while Navarro regaled me with some town history, which terminated in a very detailed story. The tragic tale continued with the grieving bride’s death and subsequent appearance of her luminescent presence on a balcony of the palatial home she was destined never to inhabit in life. “Now I’ll show you,” the Mayor said. Entrance to Casa Deliciosa with the ghost's balcony.We exited the graveyard, crossed the road and entered the over-grown grounds of Alamos’ haunted mansion, halting at the doorway. With an embarrassed shrug, Navarro confessed, “I don’t like to spend too much time in this place.” He pointed upward. “That’s the balcony, there in front of the upstairs window.” He opened the lock and we went inside the abandoned foyer. I looked up. There was no NO corresponding window inside. The wall presented only a solid face. The balcony that I’d seen outside was merely an artful facade. I turned around. And Dr. Navarro had disappeared, out into the warmth and sunshine of Mexico. Paul Ross is a Writer/Photographer & Videographer who is also the Travel Editor of "Drink me -lifestyle beyond the glass" magazine (www.drinkmemag.com) and has many other work samples at www.GlobalAdventure.us.